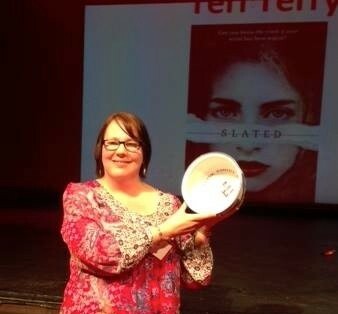 I was very excited last year to find out that Slated was short listed for the Falkirk RED book award in Scotland! 1. First Stop: Charles Thorp School in Newcastle! 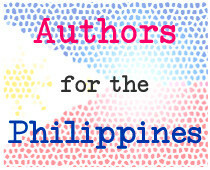 I'd put an author visit up for bid on Authors for the Philippines, an online auction raising money for the Red Cross’s Typhoon Haiyan Appeal. The winning bid was organized by awesome school librarian Beth Khalil at Charles Thorp School. 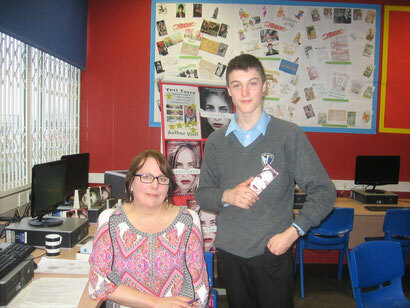 Not only did they raise all £460 to cover their bid for the red cross appeal, with sponsored reads - hurrah for reading! 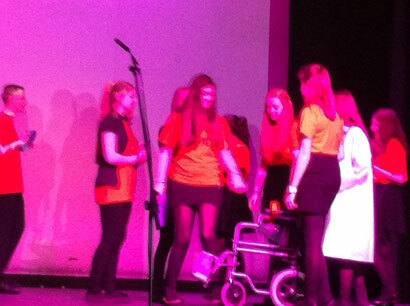 - and other efforts, they kept going...all the way to £850. Wow. 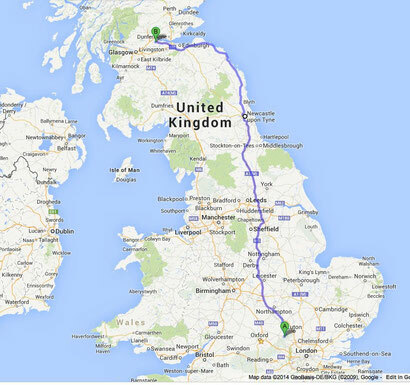 I consulted my map, and realized it was on the way to Falkirk. I had a cunning plan...and away I went. 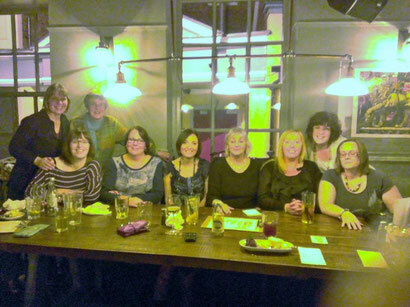 From left - Maureen Lynas, Claire O'Brien, Janet Foxley, me, Marie-Claire Imam-Guttierrez, Deborah Court, Gill Hodgson, Cathy Brumby, and Beth Khalil. We seem to be bathed in the warm light of creativity. 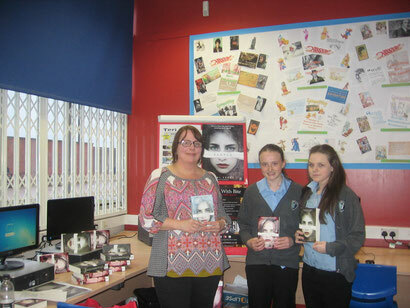 This was followed by meeting the school book group, answering some questions, and a debate about male YA characters. 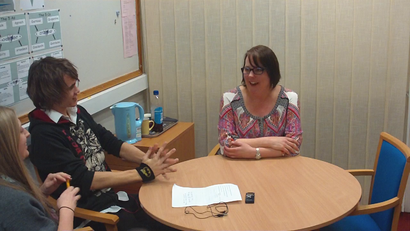 Then there was an interview by a year 11 and a year 12 student. This was videod so I'll put a link up when I can. Thanks to Beth Khalil for amazing organizing and, if that isn't enough, taking photos, too. Then it was off to the train station, where I got on the wrong train (by accident, this time: trains really do look a lot alike, don't they?). I still got to Falkirk in time for the dinner with Falkirk RED book organizer, Yvonne Manning, the awards committee, and the other short-listed authors: Chris Priestley (Mr Creecher), Matt Dickinson (Mortal Chaos), and David Massey (Torn). 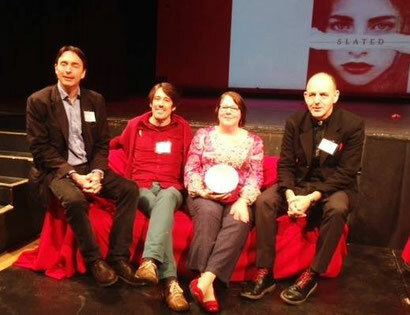 Next morning, we were all seeing red: at the Falkirk RED - read, enjoy, debate - book awards. Eight schools did presentations, so two schools for each book. They were AMAZING! They were asked questions about Slated, and if they got one wrong....they were hauled off to be Slated! Then there was Larbert Highschool, with a version of Slated that was so funny I was laughing too hard to take photos (if anyone has any - particularly of Kyla being Slated - please send them to me!). 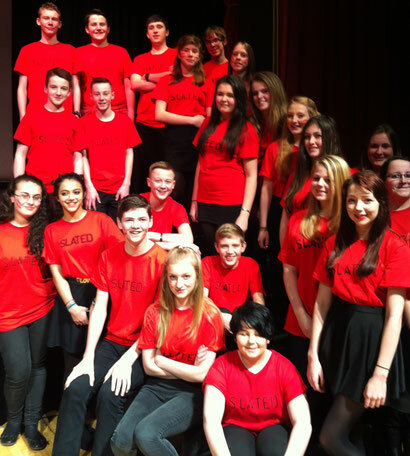 There was also an international element to the RED book award this year: an international school in Nairobi, Kenya, shadowed the scheme, and made a DVD of their interpretation of Slated. Through the day there were prizes for the best red accessories, a book review competition, a rather nice lunch and some book signing. The authors spoke for a few minutes, and also did a Q&A from the audience. And then, it was time. A lovely original ceramic bowl as prize! The whole RED experience was amazing - the enthusiasm of the librarians and students made me feel that reading is in safe hands. And I'm sure I won because I wore my lucky red shoes. the authors on the red sofa: from left, Matt Dickinson (red socks & hat-that-made-brief-appearance), David Massey (lots of red! ), me (red pattern top, with lucky red shoes), and Chris Priestley (red laces, red handkerchief)! 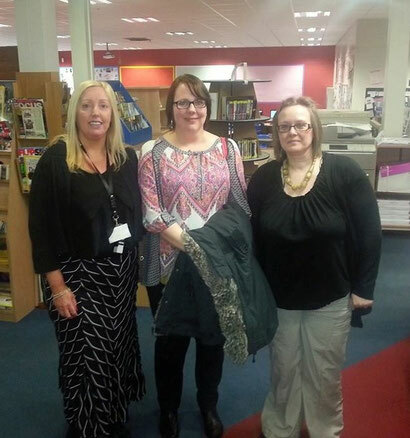 Thanks to Falkirk Libraries for the last two photos. 3. 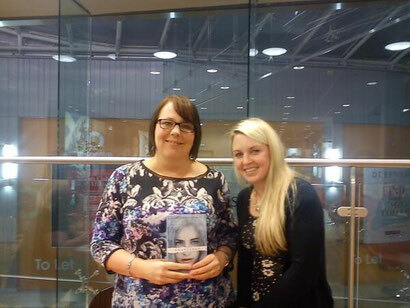 Next Stop: Waterstones, Livingston! That evening it was off to do an event at Waterstones in Livingston. This time, there was no opportunity to get on the wrong train: bookselller, pal and writer Eve Harvey wisely came and collected me. I spoke to very enthusiastic group of readers there, with Eve and the audience asking questions, and signed a load of Slated and Fractured - there are signed copies available there now! Thanks to Bonnie and Kelly for this photo. And then, there was pizza. 4. Next stop: signing books in Edinburgh! The next morning, it was time to pack and say goodbye to Falkirk, and head for the train. I got on the wrong train (on purpose, so that's okay) and met Eve in Edinburgh, and we visited two Waterstones and left loads of signed Slated and Fractured behind: available now at Waterstones West End (on Princes Street) and Waterstones George Street (strangely enough, on George Street). 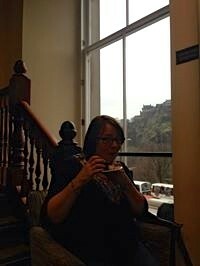 And we had the best cake with the BEST view - seriously, if you're in Edinburgh, go to the cafe at Waterstones on Princes Street. Thanks to Eve for the photos. 5. Final stop: Books With Bite party, London! I got on the right train!! Back in rainy London, it was time for the Launch party for Books With Bite. 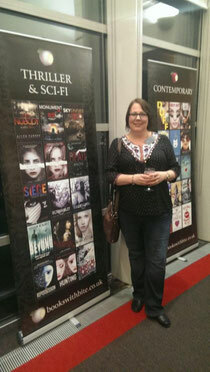 Books With Bite has been developed into three areas - Slated is in Thriller & Sci-Fi, and here I am next to the poster for it! Bloggers and booksellers were in a presentation, and then came forth. It was fun to meet people I've known on line, like George Lester, who I straight away recognized from his youtube review of Slated (here), Dani (pentopaper), Luna (lunaslittlelibrary), Michelle (flutteringbutterflies), Jenny (chocolatechunkymonkey), and Ashleigh (ashleighonline), to name a few. Other authors there included Ruth Warburton and Robert Muchamore. And there were books given away! One of which was Shattered. It's out in a bit less than five weeks now but there were some early copies there: very exciting to be signing them! Also in the back of Shattered is an excerpt from the shiny new thing I'm writing, right now. Or, at least, I should be. Once I finish this blog, and maybe have a weekend off. And then it was home time. I got on the right train - again! - and was soon yawning in my PJs and reflecting on the week. Wow, I hope you're having a good rest, Teri. This sounds like a massive trip! And hey, thank you to Charles Thorp School for your fund raising for Authors for the Philippines. You totally rock! I forgot to say: CONGRATS, Teri! Another one for the trophy cabinet! I'm so pleased i was part of your epic journey! The awards sound amazing. Wish I'd been there too. Congratulations again. Pre-ordering now. 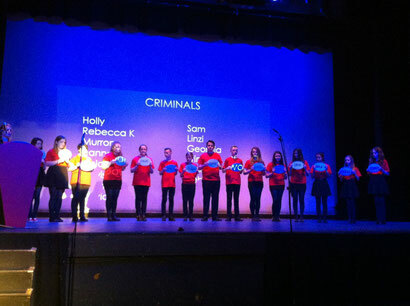 Brilliant blog post Teri and we really enjoyed taking part in the sponsored read -the kids did a great job raising sponsors, some of them raising £40 or £50 themselves! The year 9's said your visit was epic! And hi to Jackie's mum! Super post Terry, you really made the most of your time on your road trip. No wonder you are Knackered! 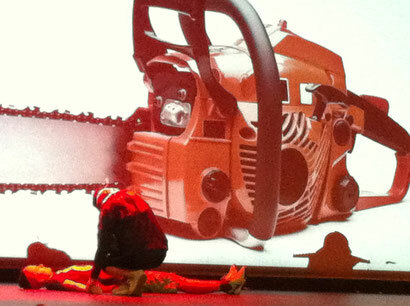 The Red Book Award was great fun, glad you enjoyed the kids presentations. I know our Larbert lot got a great kick out of it. I've got a video of their whole presentation which I'll send to you. Thanks again for all your enthusiasm, you made a lot of kids very happy. Have a well deserved restful weekend! Hi Calum, oh yes please! I'd love to see the video! Congratulations on the win! The events sound like they were great fun. Reading is so much more evolved than when I was a teenager and it's a credit to people like Beth and the other organisers mentioned here that enable it. Good stuff! Seria legal se você viesse para o Brasil, com toda a certeza eu iria querer te conhecer, você é demais!